Last year we featured the pioneering Norwegian Videokunstarkivet (Video Art Archive) on the Great Bear tape blog. In one of our most popular posts, we discussed how Videokunstarkivet has created a state of the video art archive using open source software to preserve, manage and disseminate Norway’s video art histories for contemporary audiences and beyond. 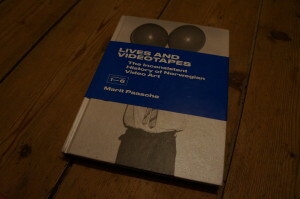 In Lives and Videotapes, the beautiful collection of artist’s oral histories collected as part of the Videokunstarkivet project, the history of Norweigen video art is framed as ‘inconsistent’. This is because, Mike Sperlinger eloquently writes, ‘in such a history, you have navigate by the gaps and contradictions and make these silences themselves eloquent. Videotapes themselves are like lives in that regard, the product of gaps and dropout—the shedding not only of their material substance, but of the cultural categories which originally sustained them’ (8). 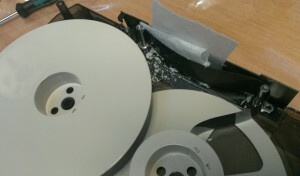 The question of shedding, and how best to preserve the integrity of audiovisual archive object is of course a vexed one that we have discussed at length on this blog. It is certainly an issue for the last collection of tapes that we received from Videokunstarkivet—a number of very mouldy U-Matic tapes. At Great Bear we have stockpiled quite a few different U-Matic machines which reacted differently to the Videokunstarkivet tapes. As you can see from the photo, they were in a pretty bad way. Note the white, dusty-flaky quality of the mould in the images. This is what tape mould looks like after it has been rendered inactive, or ‘driven into dormancy.’ If mould is active it will be wet, smudging if it is touched. In this state it poses the greatest risk of infection, and items need to be immediately isolated from other items in the collection. Once the mould has become dormant it is fairly easy to get the mould off the tape using brushes, vacuums with HEPA filters and cleaning solutions. We also used a machine specifically for the cleaning process, which was cleaned thoroughly afterwards to kill off any lingering mould. This extract demonstrates how the VO9800 replayed the whole tape yet the quality wasn’t perfect. The tell-tale signs of mould infestation are present in the transferred signal. Visual imperfections, which begin as tracking lines and escalate into a fuzzy black out of the image, is evidence of how mould has extended across the surface of the tape, preventing a clear reading of the recorded information. Despite this range of problems, the V09800 replayed the whole tape in one go with no head clogs. In its day, the BVU950 was a much higher specced U-Matic machine than the VO9800. As the video extract demonstrates, it replayed some of the tape without the artefacts produced by the V09800 transfer, probably due to the deeper head tip penetration. Yet this deeper head penetration also meant extreme tape head clogs on the sections that were affected badly by mould—even after extensive cleaning. This, in turn, took a significant amount of time to remove the shedded material from the machine before the transfer could continue. The play back of the tapes certainly underscores how deeply damaging damp conditions are for magnetic tape collections, particularly when they lead to endemic mould growth. Yet the quality of the playback we managed to achieve also underlines how a signal can be retrieved, even from the most mould-mangled analogue tapes. The same cannot be said of digital video and audio, which of course is subject to catastrophic signal loss under similar conditions. As Mike Sperlinger writes above, the shedding and drop outs are important artefacts in themselves. They mark the life-history of magnetic tapes, objects which so-often exist at the apex of neglect and recovery. The question we may ask is: which transfer is better and more authentic? Yet this question is maddeningly difficult to answer in an analogue world defined by the continuous variation of the played back signal. And this variation is certainly amplified within the context of archival transfers when damage to tape has become accelerated, if not beyond repair. At Great Bear we are in the good position of having a number of machines which enables us to test and experiment different approaches. One thing is clear: for challenging collections, such as these items from the Videokunstarkivet, there is no one-size-fits-all answer to achieve the optimal transfer. This entry was posted on Friday, May 15th, 2015 at 10:54 am	and is filed under Video Tape. You can follow any responses to this entry through the RSS 2.0 feed. You can leave a response, or trackback from your own site.